I spent the weekend decluttering and rearranging, trying to free up space in my apartment so I can identify what I need and want. Honestly, I don't think you can start to visualize how to decorate a space until you get rid of the clutter and clean it. It also helps you with the functional assessment: E.g. Do you need more storage? I'm feeling more on track than I was before. I've come up with a wishlist of items that will serve as my starting point for shopping. This is how I always shop (for both clothes and decor). I just find an example of something I love regardless of the retailer or the price and then I go searching for something that gives me the same special feeling and fits my budget. I always find it easier to have something in my mind's eye when I walk into a store and it gives me the confidence that it will work, because I've preconceived it. Of course, a better decorator can make that assessment on the fly, but I don't trust myself not to get dazzled and distracted in a store. And, as Margot has said, it's a decorating fallacy that things will all come together just because you love them (unless you have a very rigid and consistent aesthetic). And the bed... the thing that started all this? I want to check out this yes (yes, it's upholstered and from a mass retailer, which makes me a big fat hypocrite), but it was also the one used in this home, which I adore. 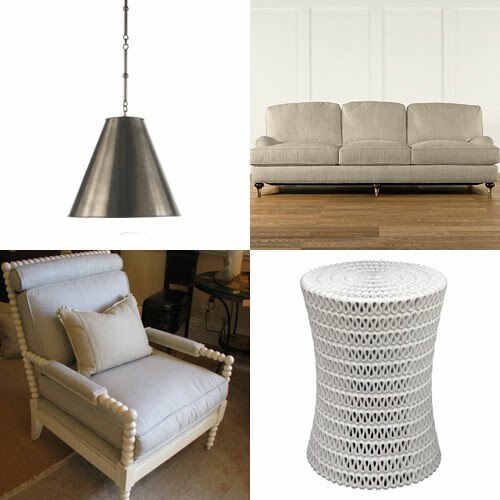 Product inspiration, first set: Goodman light (for hallway) from Circa Lighting / English roll-arm sofa from Restoration Hardware / Bobbin chair from Phoebe Howard / Pipa side table from Oly. 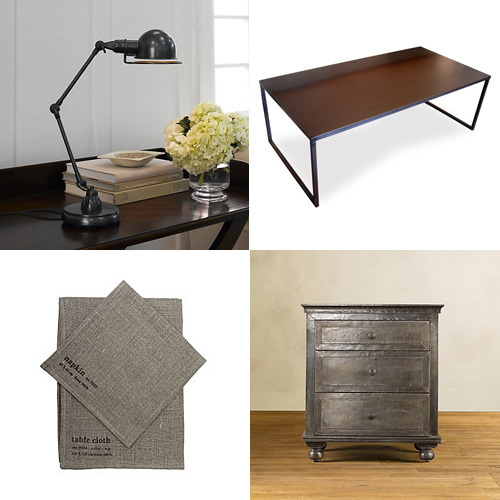 Product inspiration, second set: Atelier accent task lamp from Restoration Hardware / Hot-Rolled Steel Coffee Table from Stylegarage / Table linens from Fog Linen, via Mjolk / Zinc nightstand from Restoration Hardware.